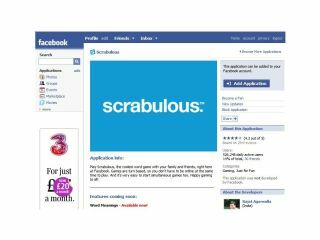 In what is turning out to be a battle of David and Goliath proportions, the makers of Scrabulous, the Facebook app that bears more-than a resemblance to Scrabble, have vowed to continue with the online game even though Electronic Arts has an official game in the pipeline. In a statement, Jayant Agarwalla, co-creator of Scrabulous, said that Scrabulous had "the attention and patronage of a large and dedicated user base." Currently the game attracts around 500,000 unique daily users a day. This month, Electronic Arts is to release an online official version of Scrabble that can be used by members of Facebook on their web pages. Trudy Muller, a spokesperson for EA, calls the game "An authorised, licensed Scrabble game experience that people familiar with Scrabble can instantly recognise as Scrabble." A bit like Scrabulous then, except for the authorised bit. One upper hand the makers of Scrabulous do have is that EA's Scrabble game will be limited to users in the US and Canada. So, those living in Britain and the like will have to make do with the highly addictive alternative that has so far been immune to copyright infringement.